The Deutsche Rheinschifffahrt Gesellschaft Köln-Düsseldorfer [Rhine River Navigation Society Cologne-Dusseldorf] is building a new boat: the “MS-Fantasie”. A commission for a wall painting on the main stairway in the interior clearly thematizing the relationship to river navigation was issued. Water and boat are inseparably connected. The visitor on the boat senses, sees, and experiences the water up close. 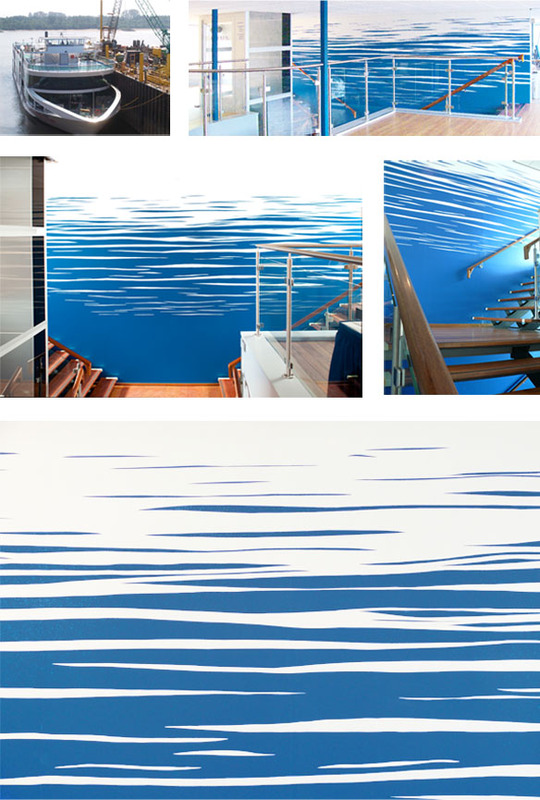 The design concept takes its theme from this close relationship and artistically transforms it into Water Lines. A blue water wall rises several stories. The color blue visualizes the element of water, sensuously conveying its immediacy. Like hulls, tapering towards their bows, the white and blue lines dance on the water; the higher the white “water lines” rise, the more they become concentrated, flowing up into the white firmament of the ceiling, creating an endless horizontal expanse.